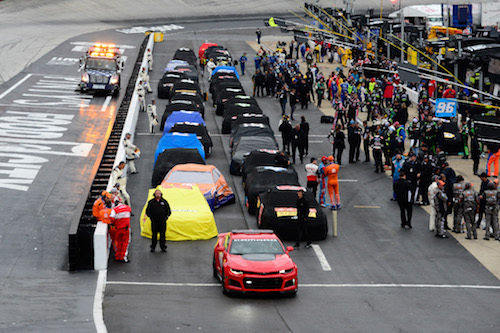 NASCAR fought Mother Nature at Bristol (Ten.) Motor Speedway and Mother Nature won, postponing the remainder of the Food City 500 Monster Energy NASCAR Cup Series race until 1 p.m. ET Monday. After multiple rain delay’s the race, scheduled for 500 laps, got to lap 204 before a final rain delay that resulted in NASCAR throwing in the towel. Kyle Larson will be the leader when the race resumes Monday, with Denny Hamlin alongside in second. Also restarting in the top-five will be Paul Menard, Kyle Busch and Ricky Stenhouse Jr.
After Busch started on the pole and led the first 16 laps, Ryan Blaney took the lead and ran up front for 100 laps before being collected in a multi-car wreck on lap 118. His car sustained significant enough damage that he retired from the race. Pit strategies varied throughout the remainder of the laps completed on Sunday through the eight cautions that included the yellow at the end of the first stage on lap 125. Brad Keselowski won the first stage of the race, the only stage completed Sunday. He battled Blaney for the lead before Blaney was collected. Keselowski assumed the lead, and while the other frontrunners pitted during the caution, he stayed out. Five other cars running near the back of the lead lap also stayed out, giving him a cushion between himself and seventh-place Kyle Busch on new tires. The race ran green for only one lap before the stage ended, and Keselowski was able to maintain his lead. Keselowski, then, gave up the lead to pit at the end of the stage, handing the lead over to Larson, who pitted during the lap-118 yellow flag. After taking the lead, Larson was a mainstay up front until Sunday’s race was red-flagged for the fourth and final time Sunday. The race was red-flagged three times for rain on lap 50, during a caution that came for rain on lap 155, and finally on lap 204. The race also was red-flagged for track cleanup from the multi-car wreck that collected Blaney. Follow Auto Racing Daily on Twitter @AutoRacingDaily or like Auto Racing Daily on Facebook (Facebook.com/autoracingdailyonline).